Aside from pen&paper roleplaying games, I love videogames. Since I am back on an MMO break (again), I finally have time to tend to my immense backlog of PC and PS4 games. In my new category ‘Completed’ I will write about games that I actually completed for a change. One of my favorite PC-games from 2013 was the Tomb Raider reboot. Back then, I always read that it’s close to the Uncharted games in quality. A series of games that can top Tomb Raider? I wanted to play them! I had no Playstation at the time, but when I got a PS3 in 2015, I got my hands on all 3 Uncharted games. They were my absolute highlights, together with Heavy Rain. If I have to pick a favorite, I will always say Uncharted 2: Among Thieves from 2009. The developer Naughty Dog only produces PS-exclusives, and they always get the best out of the console with each of their games. The intro has you dangling from a train wreck, it’s amazing. Last year saw the release of Uncharted 4, closing the saga of Nathan Drake, the most exciting archaeologist since Indiana Jones. Unlike Indy Nate mostly has altruistic motives for his treasure hunting and has been a scoundrel since his youth. You find out more about young Nate in flashbacks. Anyone who wants to avoid spoilers should probably stop reading here. The first chapter shows a younger Nate in Panama. He’s in jail, but for a purpose, together with his elder brother Sam, hitherto unknown, and their financier Rafe Adler. The trail of the largest pirate treasure ever is leading to a tower that can only be accessed through the prison. From there, the trail leads to Scotland. When the three try to get out of the prison to continue their hunt, Sam is shot and left to die. 15 years later, following the events of Uncharted 3, Nate has forsaken life as a scoundrel for his wife Elena. He’s working as a salvage diver, which is not that exciting. But one day his brother Sam suddenly shows up. He wasn’t killed but instead spent 15 years in that prison until he was able to get away when his cell neighbor, an infamous drug mobster, was broken out by his goonies. However, Sam had bragged about the pirate treasure, and the drug mobster is now blackmailing Sam, setting a deadline until Sam has to bring him the treasure of Henry Avery. Sam is now looking for Nate’s help. The younger Drake agrees, but does not divulge this to his wife Elena. That much for the basics of the plot. 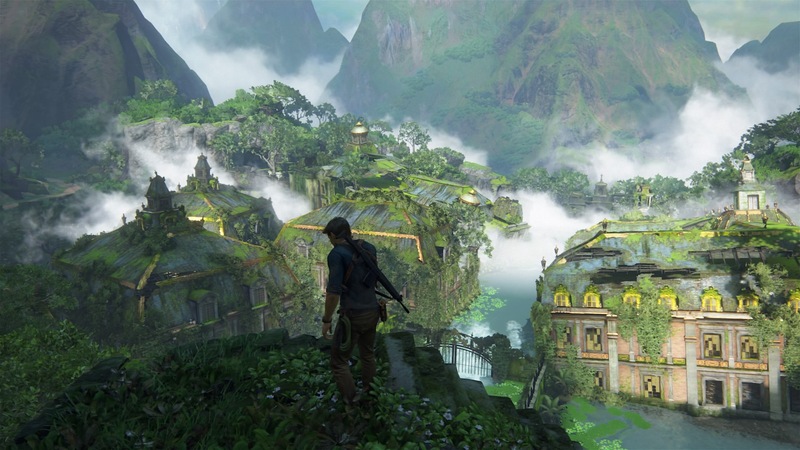 Uncharted 4 is full of exciting locations full of amazing graphics. Italy, Scotland, Madagascar, and the paradise island Libertalia. The latter really knocked my socks off, it’s that gorgeous. The latter locations are a bit similar to Nate’s hunt for El Dorado in Uncharted 1 and yet show how much Naughty Dog are pushing their game. 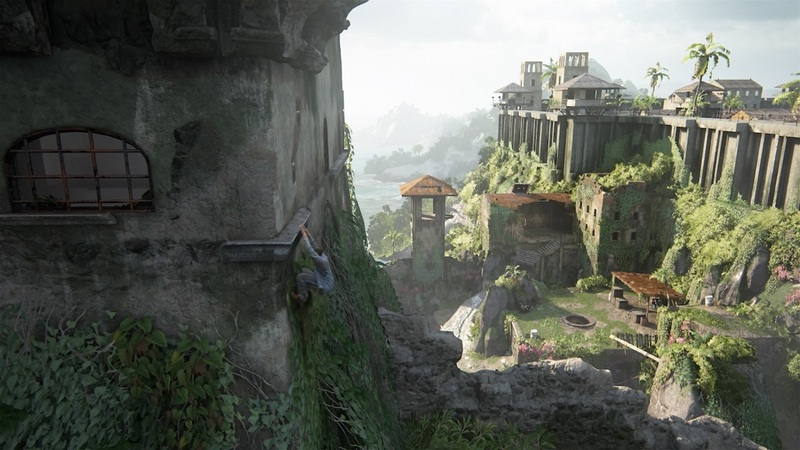 What’s new in Uncharted 4? Those who played the 3 previous games of the series, will be directly familiar with the gameplay. 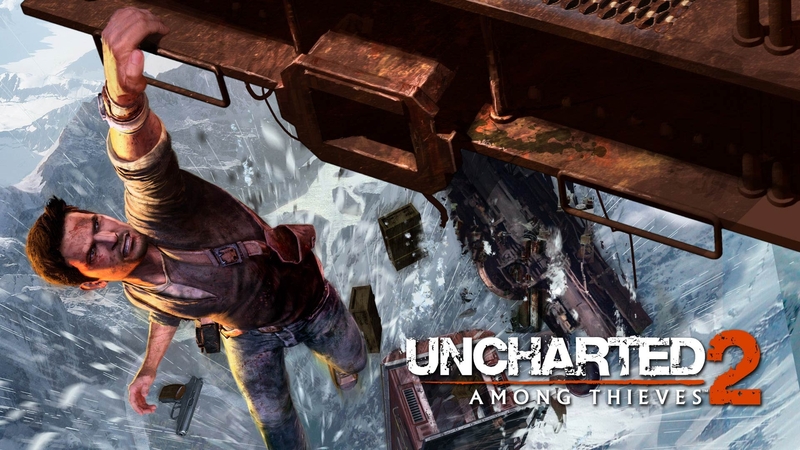 The series usually consists of three elements: climbing, puzzles and 3rd person gunfights with a cover system. Furthermore, there’s a number of Quicktime Events in action sequences. The whole package is wrapped in cinematics. Sometimes it’s hard to tell what’s a cut-scene or actual gameplay. Uncharted really is the videogame equivalent to summer action blockbusters. A popcorn game. If you don’t like those, you might not like these games. Uncharted 4 adds three new ingredients to this recipe. Stealth, a grappling hook and a climbing hook. Stealth takes some getting used to, but it really grew on me. You hide in the rich flora and stealthily kill your opponents, a mercenary band called Shoreline. This makes the battle sequences a lot easier, my least favorite part of the Uncharted games. If you manage to kill the majority of enemies from stealth, it’s definitely easier to get rid of the other mercenaries once you are detected. Furthermore, even on Moderate difficulty, you can turn auto-targeting on, which really makes gunfights a doozy, which I like. Most climbing sequences now require the use of two tools. You are introduced to the grappling hook in one of the early chapters. Pressing L1 you throw the hook, climb down the rope or swing across chasms. In the final third of the game you find a climbing hook that you can hammer into porous walls mid-jump to continue climbing. I didn’t care for this tool because it didn’t really add more difficulty to the climbs nor make it more exciting, opposed to the various uses of the grappling hook. The puzzle sequences were easily solvable and I enjoyed them quite a bit. Maybe a bit too easy, alas. My personal highlight was the clock tower in King’s Bay. The 17th century pirates led by Henry Avery really had quite advanced technology, hah. If there’s one element all games so far share it’s their linearity. You basically ran down an invisible tunnel with no alternative routes. Uncharted 4 does things a bit differently. It’s not a sandbox by any means, but I was stunned in some points. On Madagascar you drive your jeep through the landscape and there are no invisible walls, you can drive around, with sometimes no immediate hint where you are supposed to go news. Fear not, after a while the game points you into the right direction again. Driving the jeep is a ton of fun. The views are amazing. 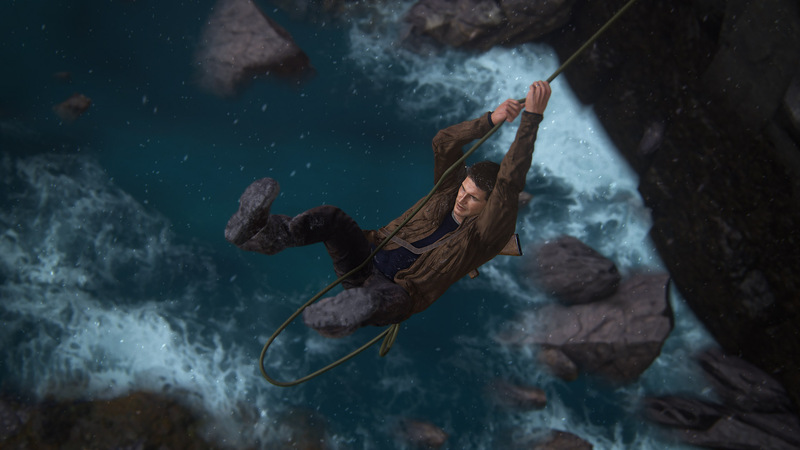 It’s not an Uncharted game if there is no crazy action sequence or chase. In Uncharted 4, Nate first flees in his jeep, then on a motorbike. The maps are enormous, and gorgeous. It’s definitely a wild ride. All maps are far bigger than the maps in previous games. Still, the chase does not beat the famous trainride from Uncharted 2, IMHO. Uncharted 4 is great entertainment for everyone who loves a lot of story in their action games. There’s twists and turns, betrayal and romance, and it’s a fine conclusion to the Nathan Drake saga. However, he must have the most forgiving wife in the history of ever, which seemed really off to me. It really is Nate’s final adventure, I think the epilogue made that clear. I will miss the characters. The voice acting is absolutely stellar. The interactions between Nate and Sam, voiced by the veteran voice actors Nolan North and Troy Baker, their constant banter, I loved it. Same for Nate and Elena. On my personal ranking, Uncharted 4 moved slightly ahead of Uncharted 2, simply because it’s so personal and extensive. Uncharted 3 and 1 are way behind those two titles. I am really looking forward to the really last Uncharted adventure likely to be published: Uncharted – The Lost Legacy. Without Nathan Drake, but with two female protagonists we’ve already met before: Chloe Frazer from Uncharted 2 and 3, and the mercenary Nadine Ross from Uncharted 4, searching for treasure in India.